The Perth Soap Co. | Neroli & Sea Salt Cleansing Bar - The Perth Soap Co.
Fresh myrtle, rosemary and and green sage notes are accompanied by sweet orange, grapefruit, lemon and cassis; followed by neroli, African orange flower, jasmine, rose, subtle watery sea salt notes with a dry down of woody musk, oak moss, sandalwood, patchouli and vanilla. 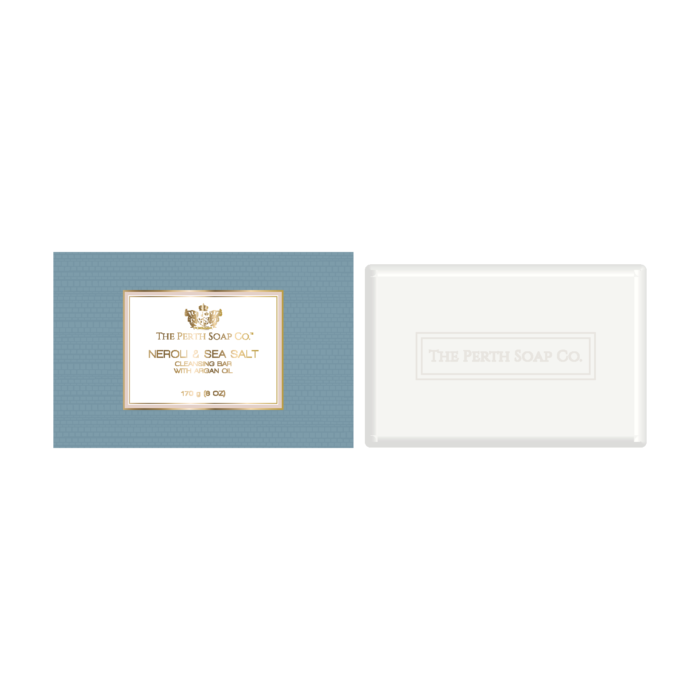 Gentle and enriched with Argan Oil, The Perth Soap Co. cleansing bars are pH balanced, contain more than 30% moisturizing ingredients and are infused with specialty fragrances that embody luxury. As with all of our products, The Perth Soap Co. cleansing bars are paraben free, phthalate free and are not tested on animals. Sodium Cocoyl Isethionate and/or Sodium Lauroyl Isethionate, Stearic Acid, Sodium Tallowate, Coconut Acid and/or Lauric Acid, Sodium Isethionate, Ethylene/VA Copolymer, Water/Eau, Argania Spinosa Kernel Oil, Sodium Cocoate, Parfum/Fragrance, Glycerin, Cocamidopropyl Betaine, Sodium Chloride, Tetrasodium EDTA, Titanium Dioxide, Tetrasodium Etidronate. ©2014 The Perth Soap Co.